This leans towards hard rock rather than punk, back to the type of music prevalent when punk burst out, and which after all most punks grew up hearing. Nearly four decades on, can a punk band offer inspiration to not only those who were raised with them, but those who never caught them at their peak? The Buzzcocks soldier on, and like many of their peers who decide to do so, they mingle their old tunes on stage with new ones. Every few years, the band tours and shares with its loyal audience both, and here are ten fresh tracks in the form of The Way. The Way opens with a catchy roar. "Keep On Believing" lacks some of the vocal punch of the early, classic songs by Pete Shelley. Dave M. Allen, known for his production of the Cure during their late ‘80s and early ‘90s reign, pushes the guitars which Shelley always had the knack for chiming and strumming ahead on the soundboard, but Allen's mix shoves back the voices, away from you. The band's second singer and guitarist, Steve Diggle, has a deeper voice and gruffer approach than the warble which Shelley perfected in the band's late ‘70s pop-punk ditties. As that line-up's outlook darkened their lyrical concerns, moving from love to despair, so their songs thickened. Similarly, on Diggle's "People Are Strange Machines", the repeated title fronts a brusque guitar riff, a bit more raw. The title track locks into a groove over which Shelley declaims a mid-tempo lament (as far as I can tell without any lyrics). Allen keeps the guitars ringing, and spreads out Danny Farrant's drum fills to support the backing "ahhs". As with the album itself, the results prove respectable, as much of band's product since Shelley and Diggle reunited in the '90s are, but it must be admitted that, as with many such efforts from reformed outfits, the original musicians and their original efforts stand up best. The band here releases its ninth studio album, but the first three, most agree, remain the band's triumph. "In the Back" could have been taken from the band's "difficult third album" in 1979. Diggle thickens the texture over a chugging guitar riff, and his blustering voice fits the blunt approach better here. As on earlier records, even more here: Diggle, usually relegated to fewer of his own tracks, here trades off, alternating with Shelley on songwriting and singing. 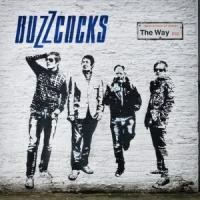 While most of the signature sound of the Buzzcocks remains linked to Shelley, his bandmate holds his own here and balances the sequence. A plaint against "social media", "flashmobs" and Twitter opens "Virtually Real" in tense fashion. Shelley's voice is a bit lower than in his prime, and the articulation is less piercing. Allen's production moves the singers deeper into the music than their punk-era albums and singles, but he wisely keeps the guitars at the front. Here, they enter an atmospheric realm, perhaps hinting at Shelley's early '70s pre- and post-Buzzcocks experimentation with electronic effects and spacious sonics. In similar mechanical style, Diggle's voice filtered through "Third Dimension" alters briefly, before a more conventional delivery takes over. However, the guitars continue the slight imitation of a glam rock swagger, again integrating suggestions of the music Shelley and Diggle loved as English teens. Speaking of glam, "Out of the Blue" is not a Roxy Music cover, but Shelley's more assertive turn at the mike. Allen for once aligns the guitars with a chance to hear a hint of the support provided by Chris Remmington, which tends to be overshadowed by Shelley and Diggle's twin leads. This song leans towards hard rock rather than punk, like most of the tracks on this album, back to the type of music prevalent when punk burst out, and which after all most punks grew up hearing. I wish "Chasing Rainbows/Modern Times" leapt out more. Diggle's vocals, once more, stay workmanlike, but the song underneath reminds me of the early band, and, if let loose from the muddle, may sound great live. After all, a look at the discography attests to their many live albums. Shelley's "It’s Not You" typifies the current band. It replicates the droning bits of riffs and the cascading drums of the band, but favors a less breakneck pace. It slows midway before returning, as some of the band's early tracks favored, and the song constructions stick to tried and true methods. Ending with "Saving Yourself", Diggle lumbers along, delivering a declamation against religion. It's not bad, but it's not noteworthy. This could have fit as a middling track somewhere on side two of a hard rock album from 1975, so I am not sure if this is progress. All in all, this album will meet the needs of fans wanting new songs from the venerable band. But it will remind many fans, as it has me, of the band's earlier work, and may pale by comparison. The Buzzcocks deserve credit for continuing to craft new material, but after nearly 40 years, they also risk sounding sometimes like some bands they emulated, or mocked, who started long before them.